This week it has been full steam ahead in the VISA Platinum Gallery. 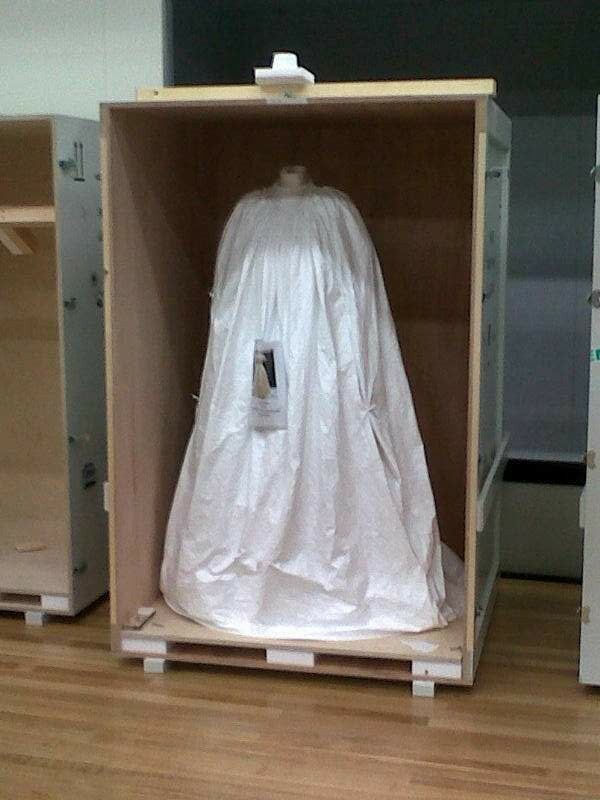 The crates carrying Unveiled: 200 Years of Wedding Fashion from the Victoria and Albert Museum, London arrived by sea, and Keira Miller and Sarah Scott from the V&A arrived by air. Over the last week Keira and Sarah, accompanied by our team of installers and conservators, have been unpacking the crates, removing layers of protective coverings, and thoroughly checking the condition of each item before placing it in its designated display case. At the time of writing 80% of the garments have been arranged in their cases, ready to be lit. 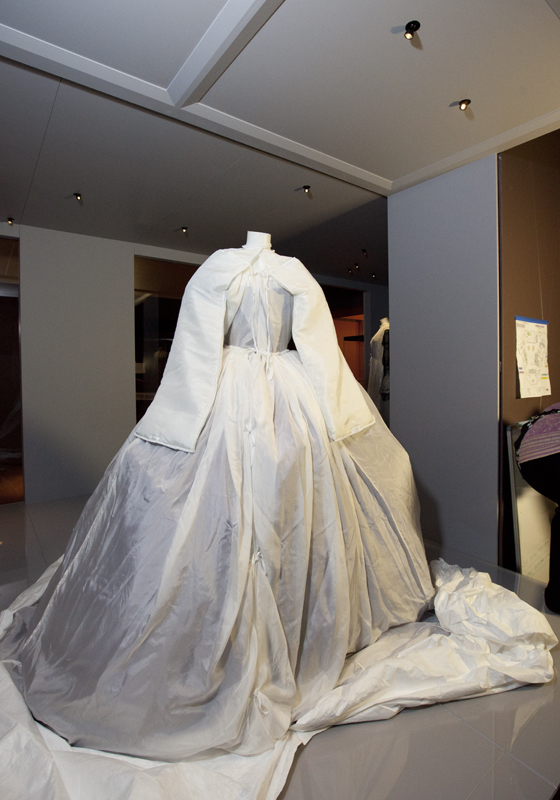 In the spirit of burlesque artiste Dita von Teese, whose magnificent Vivienne Westwood gown is in the exhibition, here is a little photographic ‘strip tease’ of the unpacking in motion. A dress in its specially made protective silk 'travelling garment'. 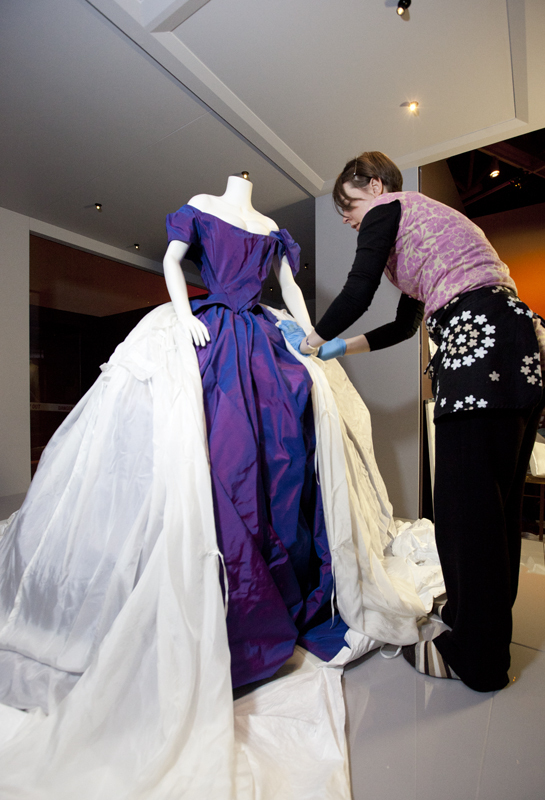 Rachael Collinge from Te Papa and Sarah Scott from the V&A remove the protective covering to reveal the splendour of Dita von Teese's Vivienne Westwood gown. Photo: Kate Whitley, Te Papa. Sarah slowly removes the protective covering. Photo: Kate Whitley, Te Papa. Sarah adds a final touch to Dita von Teese's outfit - a jaunty tricorne hat by Stephen Jones. Photo: Kate Whitley, Te Papa. 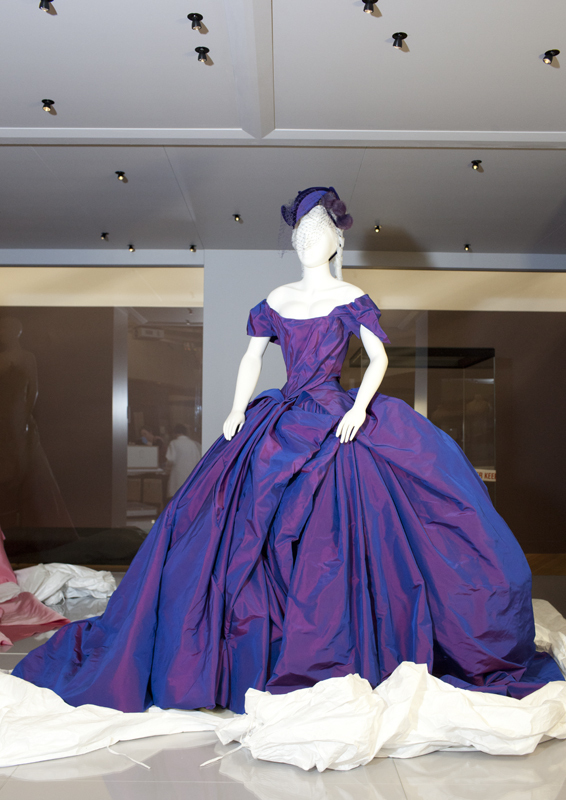 Dita von Teese's wedding gown by Vivienne Westwood fully unveiled. Photo: Kate Whitley, Te Papa. Now all that needs to be done, is to find her matching Christian Louboutin heels! To find more about the preparation of this amazing travelling exhibition, be sure to catch Keira Miller’s talk ‘Here Come the Brides’ at Te Papa’s Soundings Theatre on Saturday 17 December at 1pm. Loving it – it will be a great show! Wow!! absolutely gorgeous dress, and the colour is so vibrant – fantastic!! We look forward to your visit, and can assure you it will be worth the journey! For more information about associated events be sure to have a look at the Unveiled website. It will be updated regularly with new events. 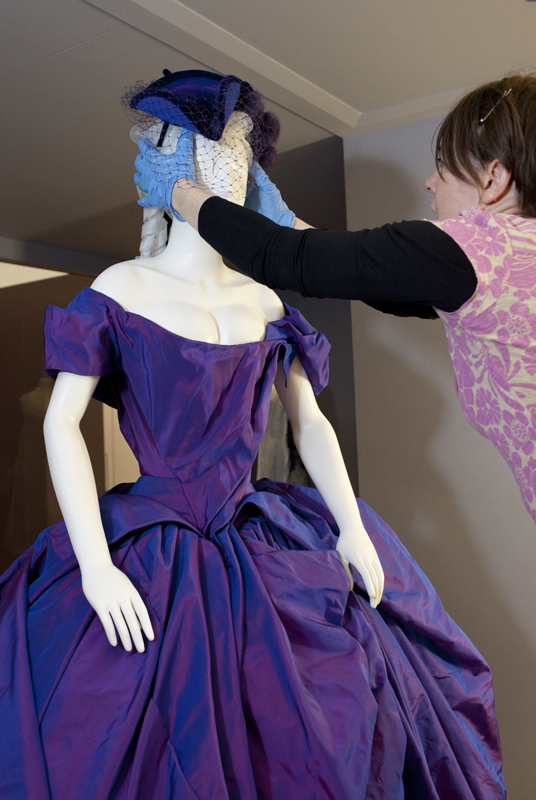 http://www.tepapa.govt.nz/WhatsOn/exhibitions/WeddingDress/Pages/default.aspx All the best, Claire.